Signed and dated within image l.l. corner, pencil "1936./ E.L. Spowers". Deborah Edwards and Denise Mimmocchi, Look , 'Sydney Moderns', pg. 24-28, Sydney, Jun 2013, 27 (colour illus.). The Sydney Morning Herald , Sydney, 10 Jul 1936, 5. 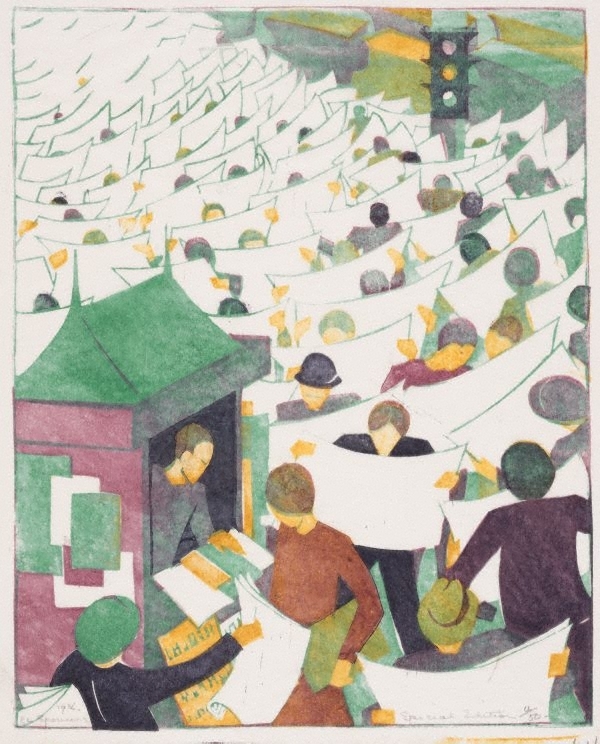 Linocuts of the machine age: Claude Flight and the Grosvenor school , 'The Australians: Dorrit Black, Ethel Spowers and Eveline Syme', pg. 65-68, England, 1995, (colour illus. ), 66, 176 (illus. ), 177. plate 36; cat.no. ES 35; NOTE: this is not the AGNSW impression.